Nine-year-old Awonder Liang broke the 2200-rating barrier this weekend at the Midwest Open Team Chess Festival at the Dayton Chess Club, according to the USCF. Pending final confirmation from the USCF ratings department, this makes Awonder the youngest master in US history. The previous record was held by World Youth gold medallist Samuel Sevian, who was 9 years 11 months and 24 days old when he became a master. Awonder was 9 years, 11 months and 8 days old. Awonder will also be attending the Philadelphia Open later this week with his brother Adream. 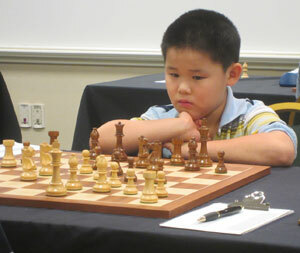 Liang (born April 9, 2003) became the youngest US chess player to beat an International Master at the US Open in Orlando, FL. The previous record was held by Hikaru Nakamura. Liang also won the gold medal in the Under-8 Open section of the World Youth Chess Championship in Caldas Novas, Brazil to achieve the the titles of U-8 World Chess Champion and FIDE Master. He also became the youngest chess player to beat a Grandmaster in 2013 in Round 3 of the Washington International in Rockville, MD.